Built into a single-stage self-contained unit, the RotaPola Rota-Tray 4x5.65 with Circular Polarizer is a compact, easily rotatable polarizing solution for most matte boxes that accept 4x5.65" filters. 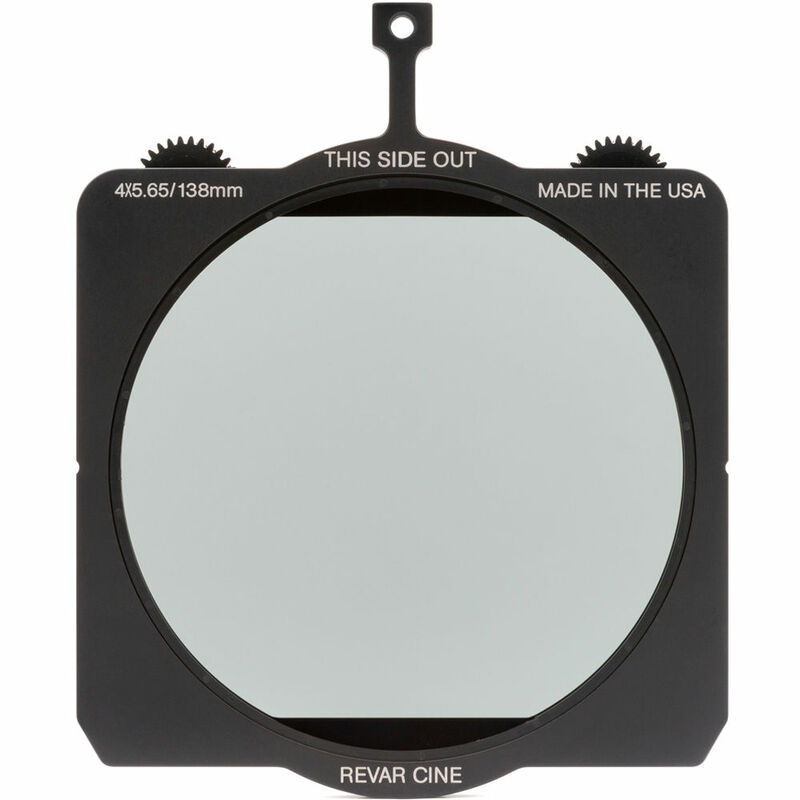 Rather than requiring a full 4x5.65" glass filter, the Rota-Tray uses an included 138mm-diameter filter which sits inside the rotating tray. If the polarizer needs to be adjusted, simply rotate one of the geared wheels, which extend from the top of the tray on either side. The included filter is a 138mm mid-efficiency circular polarizer manufactured from Schott B270 glass. It features 38% transmission (1.5 stops of light loss) and Broadband anti-reflective coating for reducing unwanted flares. The tray itself has a lightweight and rigid aluminum construction. Box Dimensions (LxWxH) 7.4 x 6.4 x 0.5"
Rota-Tray 4x5.65" with Circular Polarizer is rated 4.0 out of 5 by 1. Rated 4 out of 5 by ronnie from Useful tool for polarising. It works very well and the product is quite well made. I think they can improve on giving a better pouch. Current one is a bit sloppy. Hi just wondering if when using this filter on a 4.5mm wide angle B4 ENG lens, weather you get any vignetting when fully wide as wanting to put in in the front tray of my Croszniel matte box not the rotating back one. Based on filter being 4 x 5.65 sizing as mentioned above? The diameter of the filter is 4.5. If this is a larger diameter than the front element of the lens you own, you should be good. What makes this not compatible with Titla? I have the MB-T12 and it says trays are compatible with Arri and Panavision trays which this will work with. According to the manufacture of this product it is not compatible with Redrock Micro and Tilta Matte Boxes. The exact reasons are not specified, however it more than likely will have to do with the shape of this tray not fitting those Matte Boxes well. The included circular polarizer filter is manufactured from Schott B270 glass and is considered a mid-efficiency filter. It would be only be a small upgrade in price to purchase the empty Rota-Tray and put the Schneider True-Polarizing Water White Glass Filter in to the system. Does this filter come with any sort of protective soft case? Yes it does come with a very nice soft case. It's expensive, but worth it. Hi There, can you please tell me, could this also work on a 4 x 4 matte box? No this is for 4x5.650 with 5.650 being the horizontal dimension so will not fit in 4x4 slot. Suited to ARRI LMB 5 or LMB 15 or LMB 25 amongst others.